Singaporean English: The English language is one of the four official languages in Singapore, together with Mandarin Chinese, Malay and Tamil. 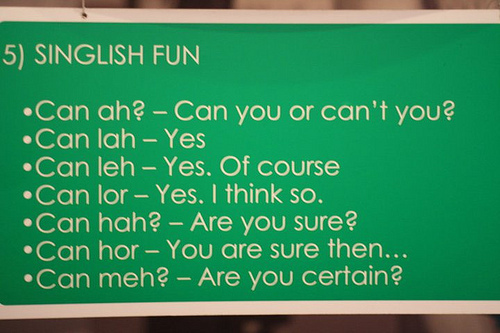 The English of Singapore has been used in English-medium education since the period of British colonisation, and later expanded to the country’s business and commerce, government administration, and daily-life communication. The Singaporean English is the standard variety with an accent based on the prestigious Received Pronunciation, which can often be heard in the news broadcasting. The Singapore Colloquial English (Singlish) contains forms ranging from the least prestigious – which bears strong influence from Chinese (dialects) and Malay, to more prestigious – which mixes with the standard but some distinctive features. Singaporean English accent is non-rhotic (i.e. the lack of [r] sound), and syllable-timed (i.e. almost equivalent stress on all syllables, and a lengthened tone at the final syllable); its intonation flows like singing songs, but has short tones; glottalisation at final consonants. Watch the video and pay attention to the speech of each character, before attempting the questions. What has the Singaporean Government launched since 2000 as an attempt to promote the use of Standard English while controlling the spread of Singaporean English or Singlish? Which phonological features have appeared in the pronunciation of English terms by the young Singaporeans in the video? Choose more than one. Which languages, dialects and/or accents can Tyler, the Singaporean White boy, speak?